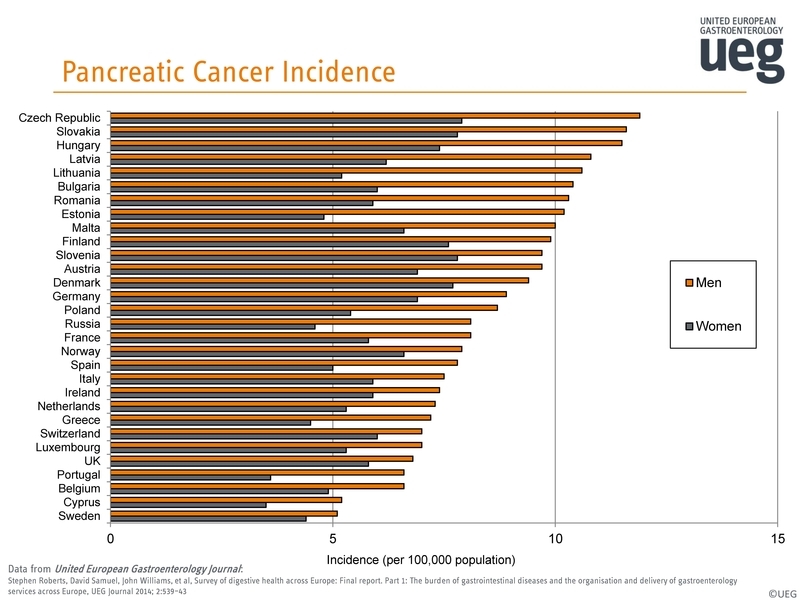 Pancreatic cancer is the eighth most common cancer in Europe, yet knowledge of the disease is alarmingly low. 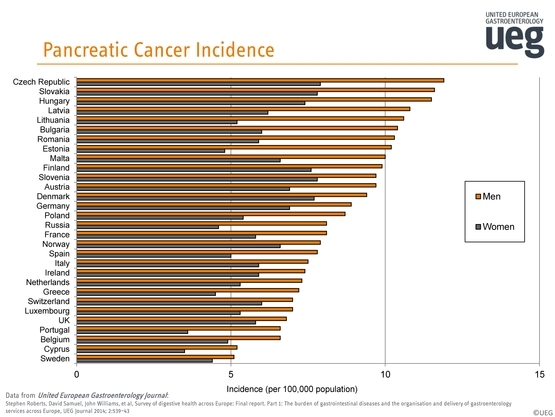 One and five year survival rates for pancreatic cancer are lower than all other digestive cancers. Symptoms can often be hard to identify, making it difficult to diagnose early and in time for surgery. Policy makers, stakeholders and patient organisations are welcome and encouraged to use the resources found here on social media, websites, newsletters and all other channels. All information is taken from the UEG Survey of Digestive Health Across Europe, unless otherwise stated. 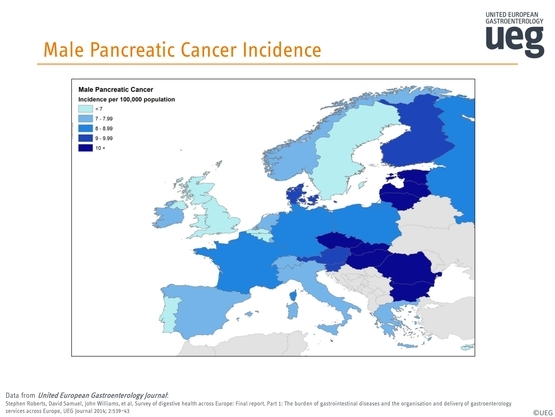 'Pancreatic Cancer Across Europe - Taking a united stand' provides a concise overview on the state of pancreatic cancer across the continent. UEG and its partners are also calling on six initiatives to transform pancreatic cancer outcomes by 2035, which include an increase in research funding and the delivery of a pan-European standard of care. Canvassing the opinions of leading European digestive cancer specialists, stakeholder organisations and patient groups, the report highlights the scale of alcohol consumption across Europe and its direct and indirect impact on digestive cancers, including pancreatic cancer. 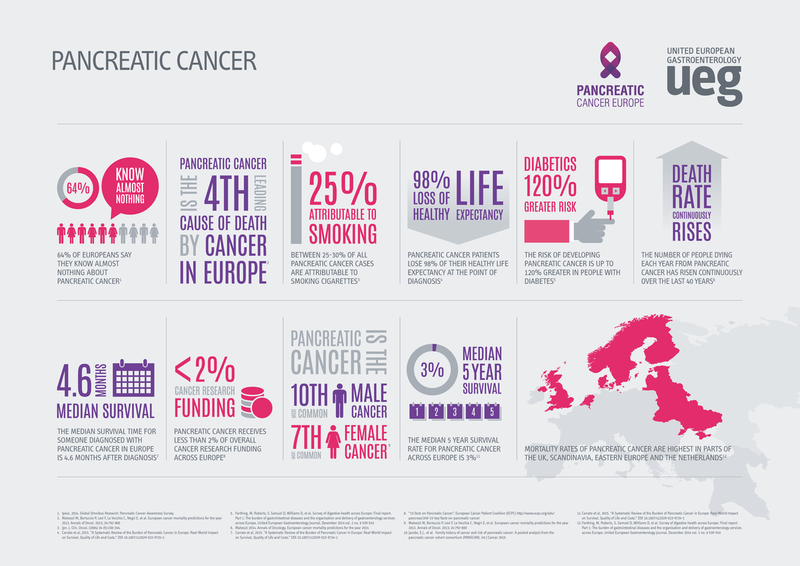 A declaration on Pancreatic Cancer calling for concerted action across Europe by 2020. Including 5 key steps that must be taken to improve patient outcomes. Patient organisations are encouraged to sign up and support the Declaration here. A quick guide for GPs on when to refer patients to pancreatic cancer specialists. The Pancreatic Cancer White Paper was launched by the EAMP in collaboration with EUPancreas. It is a direct appeal to policymakers, legislators, and regulators to encourage innovation, to enhance prevention, and to broaden access to treatment. It also calls on all stakeholders to work more closely together to reduce the burden of pancreatic cancer on patients and on society. A range of short advice guides for patients, developed and reviewed by medical professionals and people who have been affected by pancreatic cancer. Please click each one to view. What is pancreatic cancer and how is it diagnosed? Pancreatic Cancer: Stuck in the 1970s. 10 Things you didn't know about Pancreatic Cancer - from Cancer Research UK. 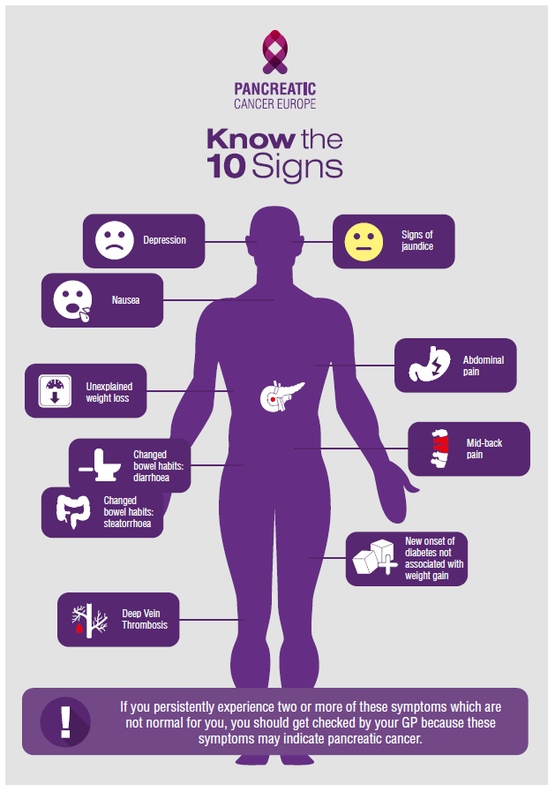 Do you know the symptoms of Pancreatic Cancer? - from Pancreatic Cancer Action. Through global collaboration we raise awareness of pancreatic cancer, and by coming together we strengthen the efforts of all our member organisations. Pancreatic Cancer Europe is a European multi-stakeholder platform which aims at bringing together experts from all over Europe including academics, physicians, politicians, patient groups, journalists and industry with a common interest and willingness to improve care for patients with pancreatic cancer. 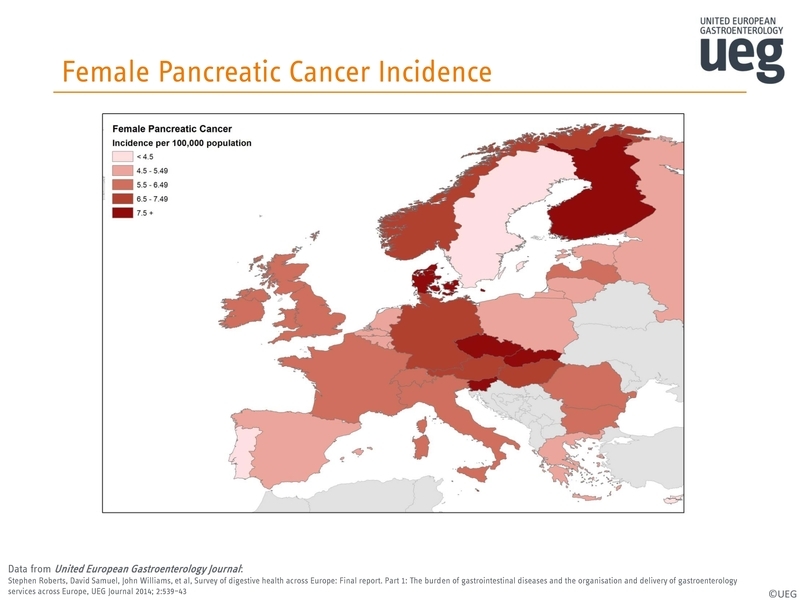 EUPancreas is a European network that aims to unite pancreas cancer research groups across Europe and provides an innovative and unique platform for collaborating and sharing information, ideas and experience. The group interacts with patient organisations and other key European stakeholders to better patient care. 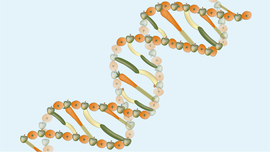 Greece: "KEFI"" Association of Cancer Patients of Athens"
Information in this section has been checked and where necessary updated by UEG pancreatic cancer experts Matthias Löhr and Sorin Barbu. Last updated September 2016. Useful information, statistics and resources for policy makers, stakeholders and patient organisations.